Pictured: Jillian Hervey of the neo-soul group Lion Babe. If you are an avid user of Twitter or social media in general, congratulations, you are among the 2 billion global citizens to do so. 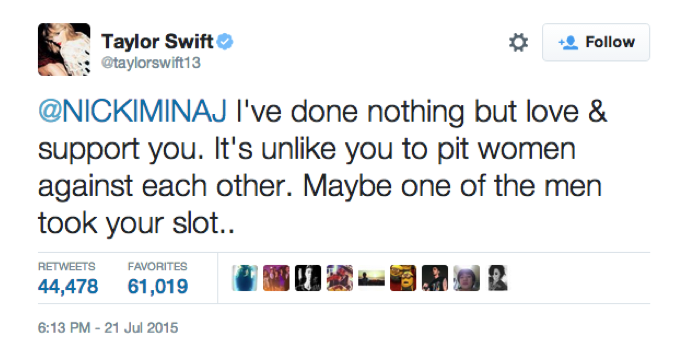 As some users may have noticed the rise in musical disputes has surged dramatically over the past couple of days, focusing primarily on Nicki Minaj & Taylor Swift. With the 140 character limit the artists engaged in the most expressive way one can under those circumstances. 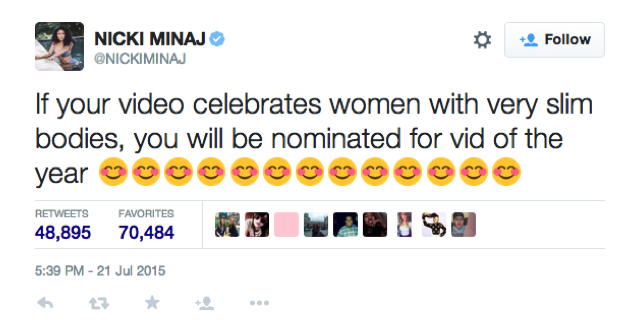 Nicki began with a critique of the VMA’s not nominating her for video of the year. 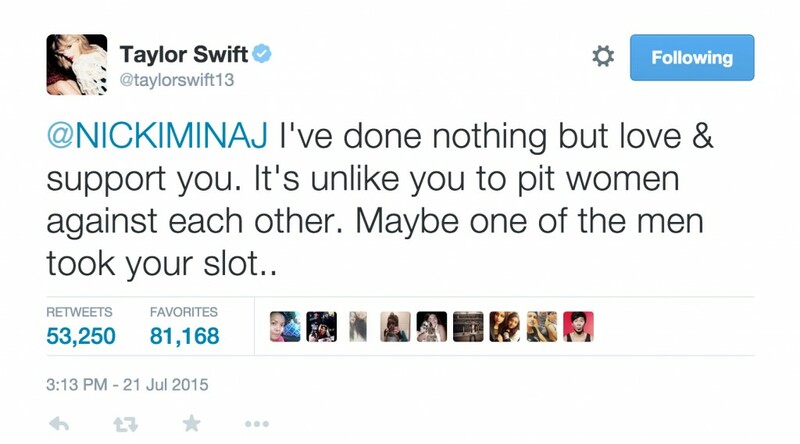 Although the critique was targeted at MTV and not necessarily the other stars nominated for the award, Taylor Swift took ownership of the critique, responding that she did not expect such a reaction from Nicki Minaj, placing herself in the position of the victim. 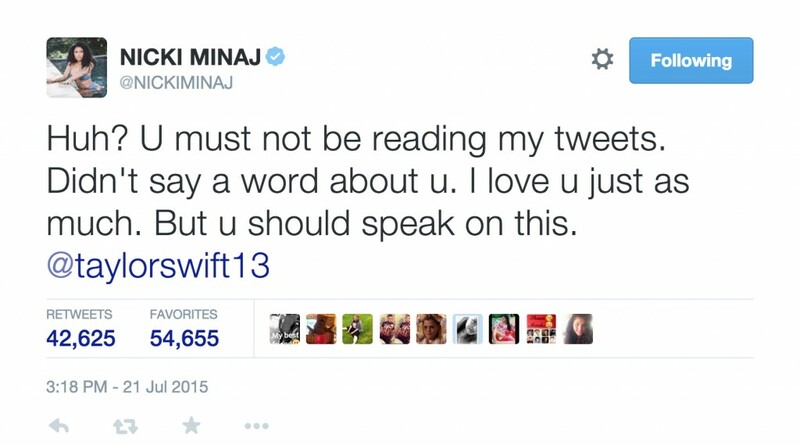 The situation took full height when Nicki explained that she was not in fact attacking Taylor Swift directly, but expressing her disappointment in MTV’s complete disregard for her contributions to culture through both the “Feeling Myself” and “Anaconda” music videos. Though this argument has exposed several comedic, insightful and stressful articles from Piers Morgan to Vice, I thought this opportunity to be the best time to critique my own and other contributions to WRMC or college radio in general. College radio, over the years, has been advertised as a space available to young White Americans. The associations with college radio are often with brooding sad indie artists and listeners, draping flannel on their bodies and escaping into clouds of smoke. It’s all very nineties representative. College radio may be inherently accepting of whiteness because college and universities are vessels filled with young White people. However, it is my understanding that the best parts of college radio involve providing a space for unknown artists to also be charted, to also share their art with a fan base that is not influenced by money, but instead placing greater legitimacy in the music making process without bias. So, it has become a wonder to me why the WRMC community, in particular, often fails to accommodate artists of color. Even when supporting mainstream black female artists there are several confined spaces in which they are discussed or praised. Scrolling through the pages of WRMC social media, it becomes apparent that the most reoccurring black woman on the site is myself. As an organization there is a tendency to gravitate towards unknown white musicians and only set the time out for mainstream black artists (female in particular) like Nicki Minaj or Beyoncé when it feels convenient (i.e. the booth room or for a couple of minutes in the corner of the Mill). Although both artists are producing great content for music and the image of black females, they are not the only black females making music or the only ones deserving of attention. The contributions to black female sexuality and female sexuality in general has benefited a great deal from artists willing to take on a multitude of their personality and physical character to express said personality. Through music black women can seek new ownerships of feeling and physicality. Vulnerability and confidence can coexist in one body and be an aspect of several races, despite expectation. This is a monumental source exercised through music that should be acknowledged, not just in artistry and not just ironically. If the role of college radio is to provide an opportunity for unknown artists and obscure Bandcamp musicians to find a platform, then our role as a community should be far greater than scanning the top page of Pitchfork for familiar black faces to download. When often confronting others about the issue the responses range from, “Should we be playing more Erykah Badu” to “I don’t know.. I don’t really like hip hop or rap.” These are both cheap responses to an issue that is so easily fixed with a couple of clicks on social media and communal attention. Besides, the genre fixation of black artists is an incomplete judgement. It has taken some time to realize that my lack of expression in musical spaces such as WRMC is a contribution to the overcast that is placed over the necessary conversation of black bodies in music. As a community we contribute to the viewing of black female artists in the form of ironic cultural fetishization, but seldom take the time to understand their contribution to pop culture. There have been three main points of race as a WRMC discussion: Big Freedia’s concert and appropriation discussions, Kendrick’s Lamar’s “To Pimp a Butterfly”, and Sepomana being more representative. All three isolated instances that were dropped in importance just a couple of weeks outside their happening. The peak of this disregard was apparent to me when Kendrick Lamar’s “To Pimp A Butterfly” was released. It was hard to imagine that the amount of radicalized conversations would ever happen, let alone be so isolated in one instance. Everyone had an opinion about what the album “meant”, wondering if they could find a way to relate to the album, solely investing in Kendrick’s jazz samples. Revolutionary, iconic, impactful. It wasn’t until the last song at the WRMC top 91 party that I realized that bodies popping back and forth, arms circling in the air did I feel actual discomfort. The detachment was strong, there were even people who would let me know how mediocre the album felt, as if I were Kendrick’s musical rep. I wanted to think, “it’s just a song.” But I could not. Intersectionality of music is so important, especially when it pertains to artists of color who get tossed aside as a funk beat and words that catch. At the time writing this didn’t seem important, because I was busy trying to convince myself that they were all “just songs.” However, the issue over the VMA nominations has incorporated an element of gender in addition to race and I can’t help but feel more attached to the idea of racial and musical exclusion by myself and WRMC. Years of family arguments defending a taste in music that does not belong to one race just because it is often associated with it. Listening to black female artists discuss a range of emotions and not subscribe to anger, sing explicitly of sexual experiences, not conform to social expectations of passivity, and advocate for a variety of body image in pop culture has provided me with a greater comfort in myself. It makes me and others feel great on an auditory level as well as personally. This did not need a media event to make it feel relevant. Black female artistry deserves the attention of listeners without a campus-changing concert, without a speaker on campus, without a twitter fight. Their contribution to music has continued to be revolutionary, iconic, impactful and should be treated as such. These are just a few black female artists as well as some women of color, ranging in genre. Tv on the radio are great! my company needed CA CP10.5 recently and was made aware of a website that hosts a searchable database . If people are looking for CA CP10.5 also , here’s a https://goo.gl/td9Wv2.